Situated next to a beautiful golden coast, on one of the most beautiful islands in Greece, Crete, and within a 20 km distance from the airport of Heraklion, a colorful garden of more than 500 palm trees, fragrant flowers and plants, awaits for you to create your new holiday memories. 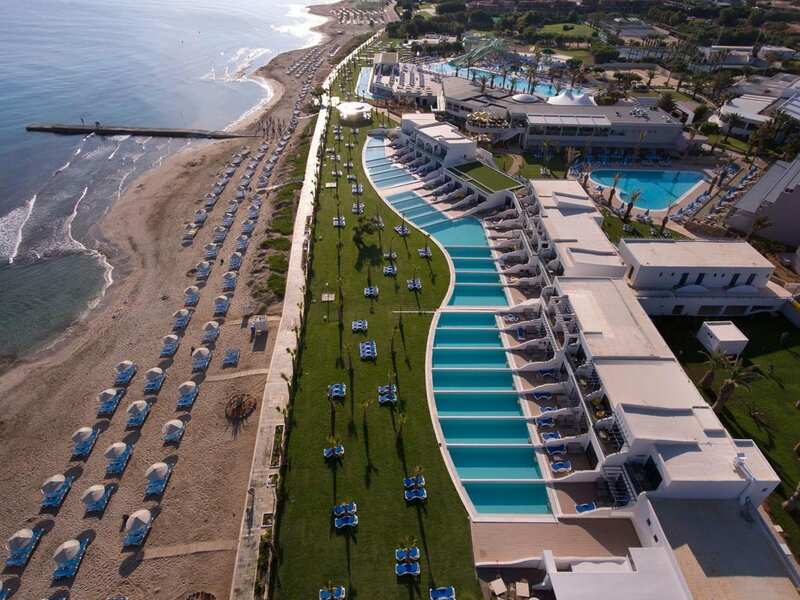 In the famous holiday destination of Hersonissos, the hotel can easily be compared to a heavenly scenery. 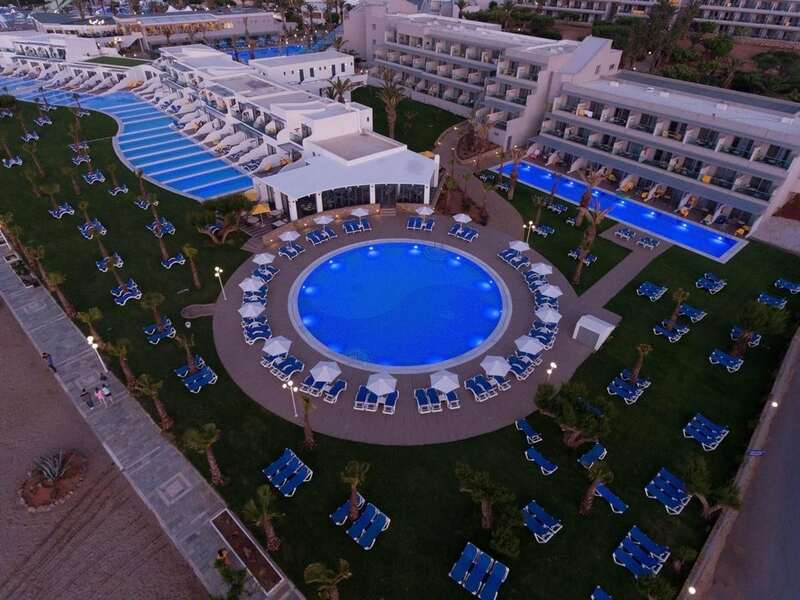 Just 5 km from the town, in an area of 150 acres leading to a 350 m fully organized, Blue Flag awarded beach, Lyttos Beach is unlike any other hotel in the island. 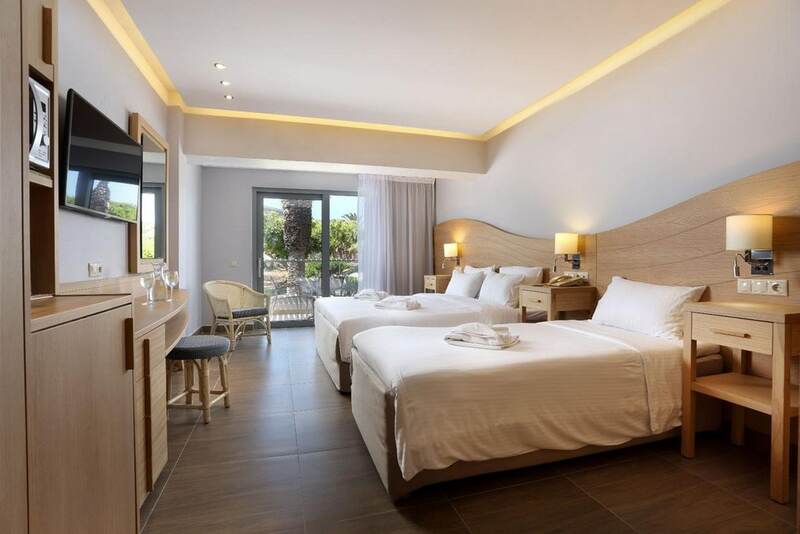 Its rooms feature sea or garden view double rooms, family rooms and suites with or without a swimming pool, all equipped with free Wi-Fi. 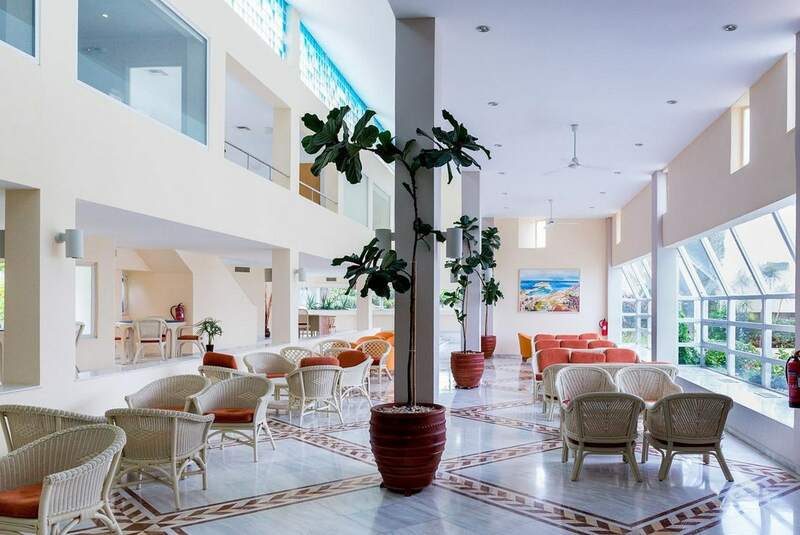 This hotel, located in the famous tourist spot of Hersonissos, can easily be compared to a heavenly place. 20 km east of Heraklion airport, 500 m to Analipsi. Access to the beach via a small footpath. Sandy beach, the entrance to the sea: sand and pebble. Sun beds and umbrellas on the beach for a fee, by the pool for free. At the bars: Cocktails, Soft drinks, juices, local draught beer, house wine, International branded alcoholic spirits, coffees and tea. 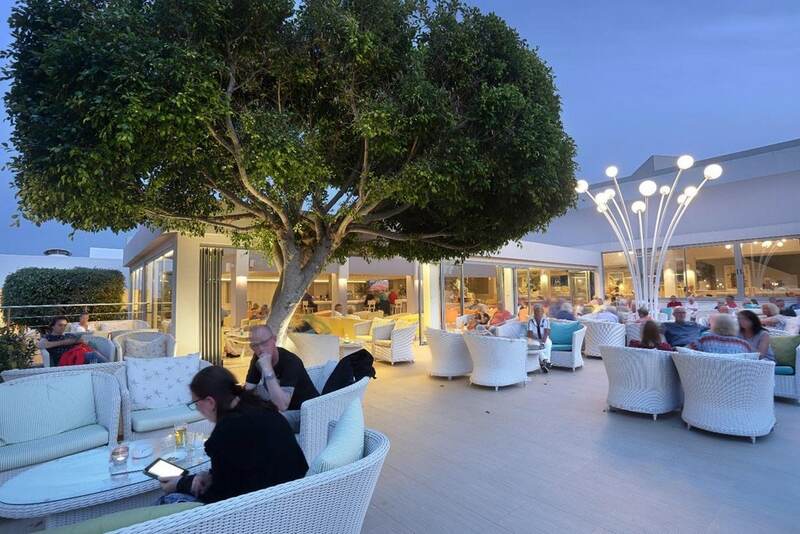 Snacks: Ice-cream, various cold and hot snacks like freshly-made Italian style pizza, waffles & pancakes with chocolate and honey, mini sandwiches, salads and fruits from 11:00-17:00 (Pool Bar). 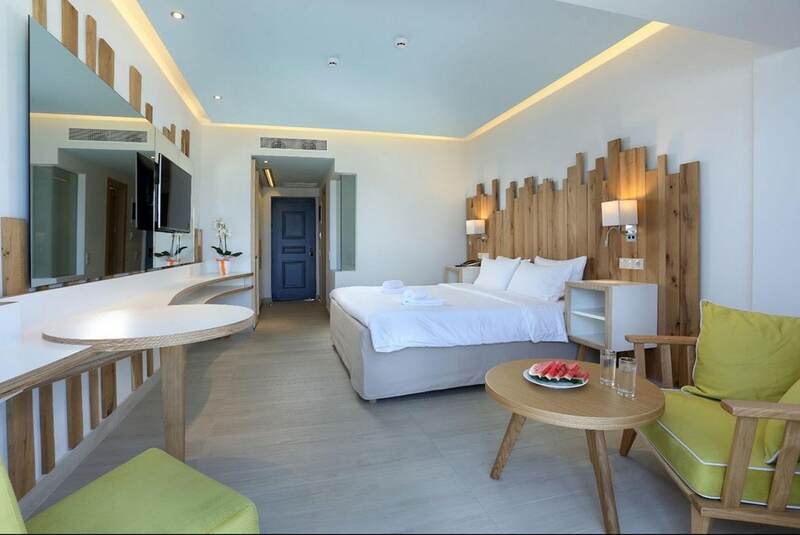 Elegantly designed and spacious family friendly guestrooms, featuring a bedroom with a double size bed, separated by a sliding door, a second sleeping area with two single beds, ideal to accommodate a family with one or two children. Decorated with modern furniture in warm colors and delicate fabrics, bathroom, floor-to-ceiling glass windows and balcony. These rooms feature beautiful views to the flourishing natural gardens. All rooms are equipped with new beds and mattresses, new 42’' LED flat screen TV (one TV in each sleeping area) and electronic card door locks for additional safety. Elegantly designed, renovated and spacious family friendly guestrooms, featuring a bedroom with a double size bed, separated by a sliding door and a second sleeping area with two single beds, ideal to accommodate a family with one or two children. 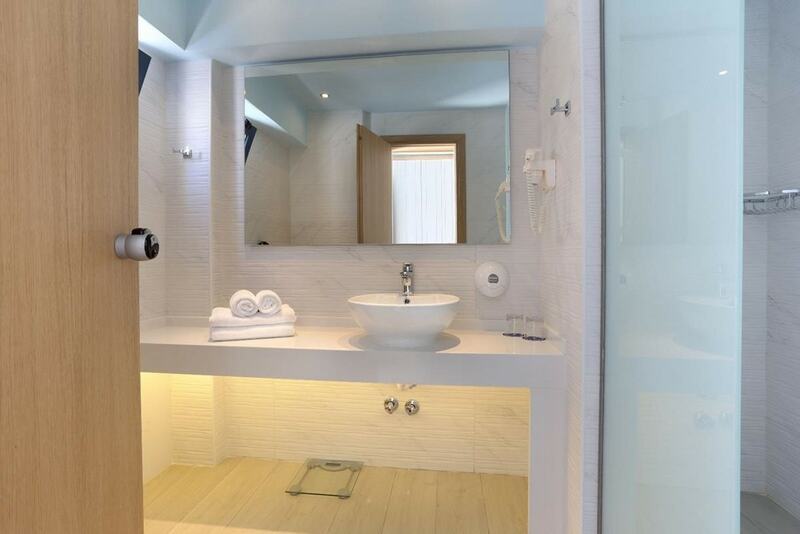 Decorated with modern furniture in warm colors and delicate fabrics, bathroom, shower, glass covered balcony. These rooms feature beautiful and relaxing views to the sea. This Family room type is a new special class of accommodation, with added comforts for families travelling with children or friends, as they feature 2 sleeping areas visually separated with 1 double and 3 single beds, two bathrooms with shower, generous closet space and bright summer color interiors. 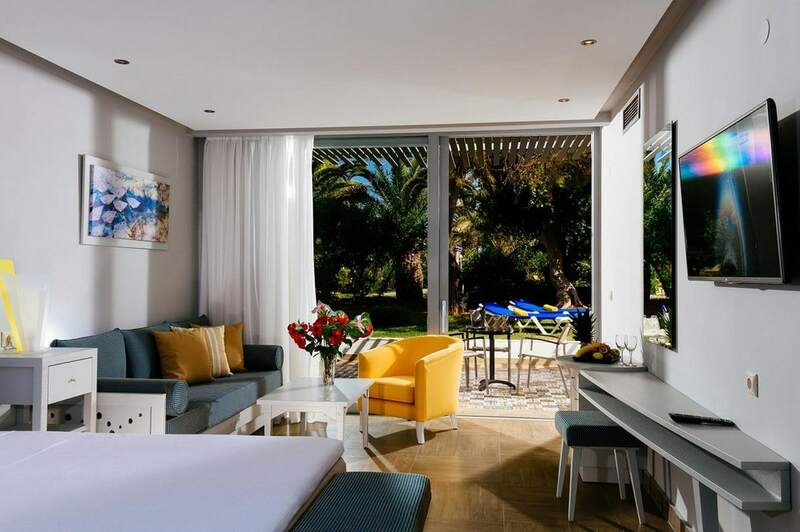 This spacious room opens to a private terrace, with relaxing views of the deep blue Cretan sea. Our most spacious room, for maximum 4 adults and 2 children offers a master bedroom with 1 double bed plus 2 extra door-separated rooms (one with a double bed with sofa, and another with 2 single beds). These suites are a special and premium class of accommodation, with extra value comforts for families travelling with children or friends. This spacious room features a welcome hall, three sleeping areas, two bathrooms with bathtub and shower, separate WC, generous walk-in closet space and bright summer color interiors. The apartment opens to a private front furnished terrace with sun chairs. This Family room type is a special class of accommodation, with added comforts for families travelling with children or friends, as they feature 2 sleeping areas separated by a sliding door with 1 double and 2 single beds (along with a sofa), two bathrooms one with bathtub and one with shower, generous closet space and bright summer color interiors. 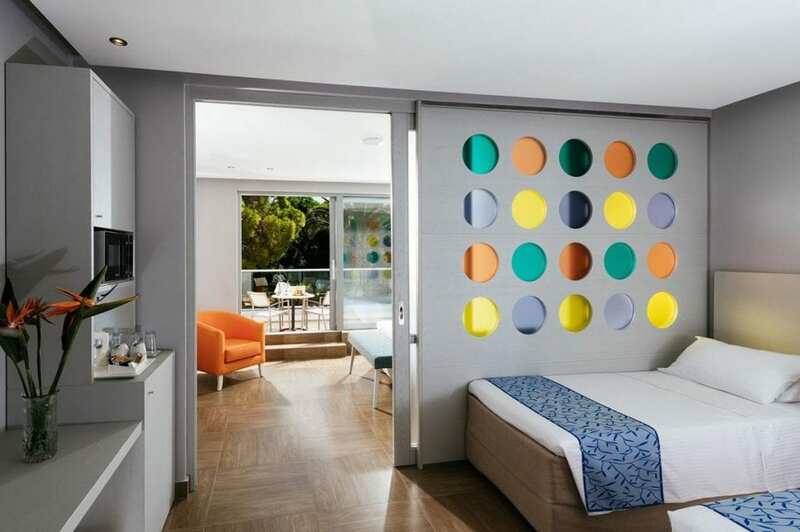 This spacious room opens to a private terrace with sun chairs, surrounded by multi-colored gardens scenery. Our finest room class. Located directly on our 350m long sandy Blue Flag awarded beach, these first row Junior Suites offer the ultimate sea front holiday experience. 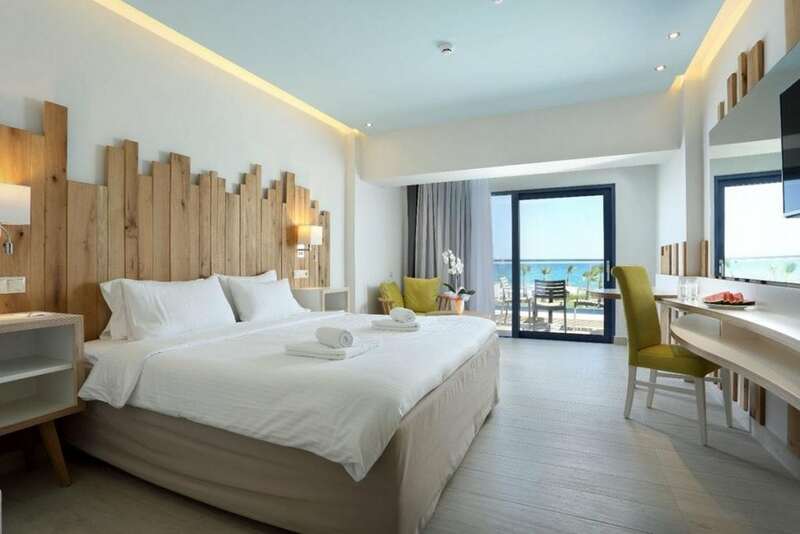 A comfortable guestroom, featuring a bedroom with a double bed and a comfortable sofa, bathroom, floor-to-ceiling windows which open to a private pool very close to the gorgeous Cretan sea, for the absolute holiday experience. 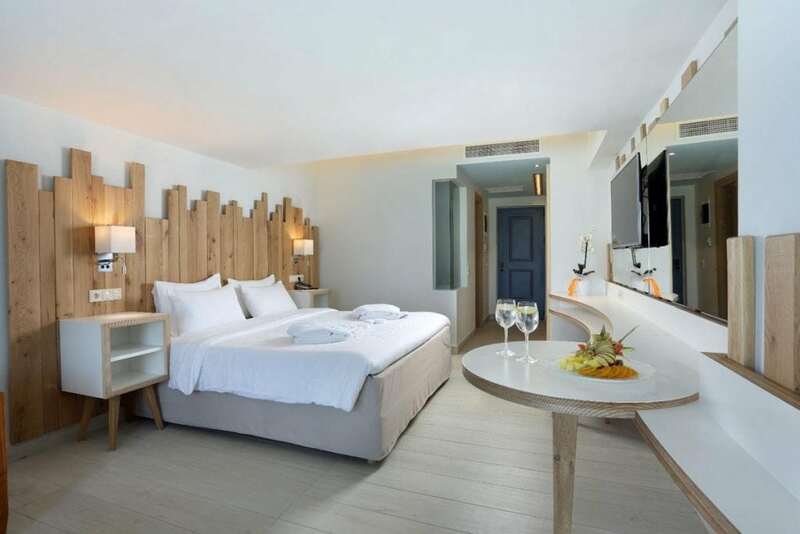 This room category offers direct sea and palm tree views for soaking up the eternal Cretan landscape. As a special welcome, guests of this room type will find a fruit basket and a bottle of fine wine upon their arrival. All rooms are be equipped with new beds and mattresses, new 42’' LED flat screen TV and electronic card door locks for additional safety. 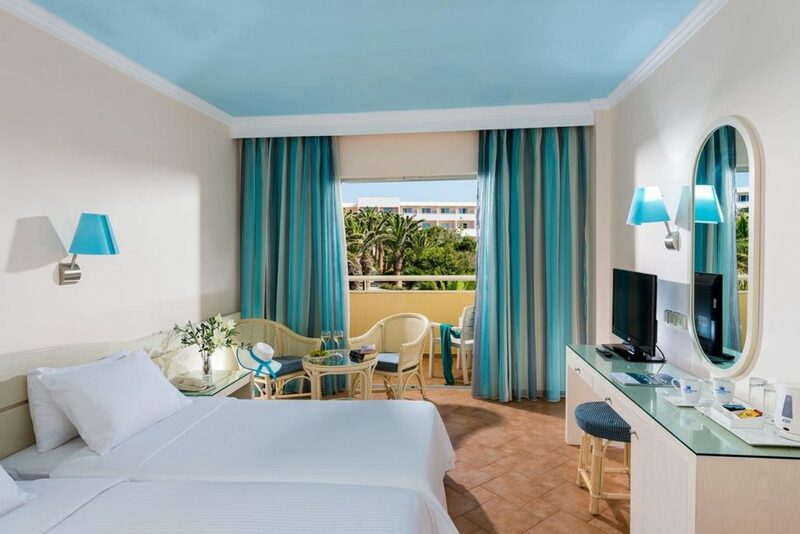 Our special room category, located directly on our 350m long sandy Blue Flag awarded beach, these first row Junior Suites offer the ultimate sea front holiday experience. A comfortable guestroom, featuring a bedroom with a double bed and a comfortable sofa, bathroom, floor-to-ceiling windows which open to a large sharing pool for all day fun. 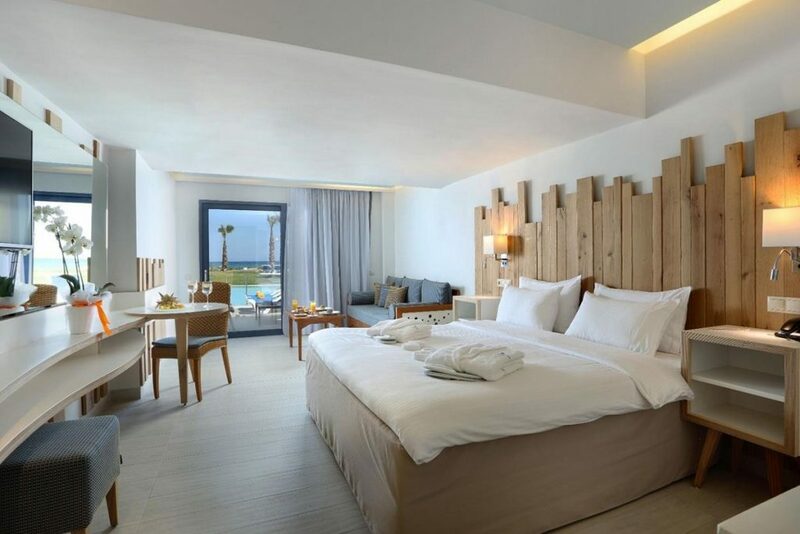 This room category offers direct sea and gorgeous palm tree views for soaking up the eternal Cretan landscape. As a special welcome, guests of this room type will find a fruit basket and a bottle of fine wine upon their arrival. This Family room type with the added value of a large sharing pool, is a new special class of accommodation. 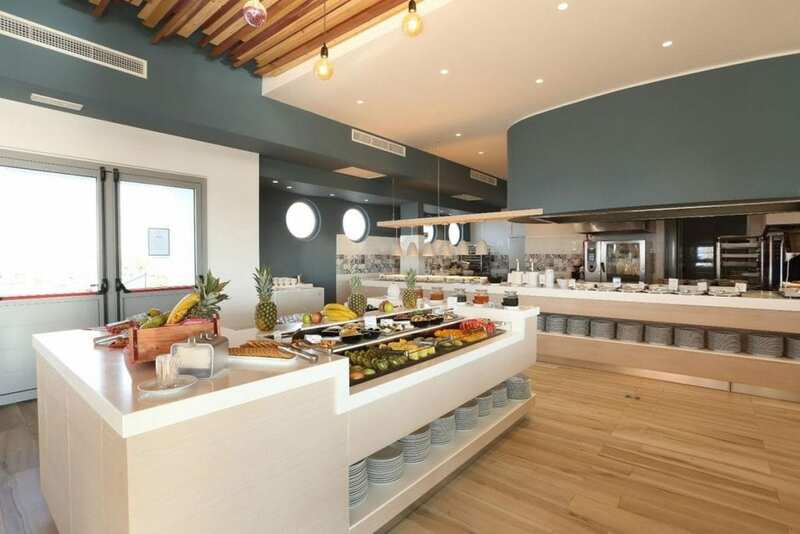 It offers extra comforts for families travelling with children or friends, as they feature two sleeping areas visually separated, with 1 double and 3 single beds, two bathrooms with shower, generous closet space and bright summer color interiors. This spacious room opens to a large sharing pool for maximum fun, with relaxing views of the sea. As a special welcome, guests of this room type will find a fruit basket and a bottle of fine wine upon their arrival. One of our finest room categories right in front of the ocean, a Suite with the added value of a large sharing pool, is a new special class of accommodation and offers added comforts for families travelling with children or friends, as they feature two separate sleeping areas (visually separated) with a double and 2 single beds, bathroom with shower, generous closet space and bright summer color interiors. 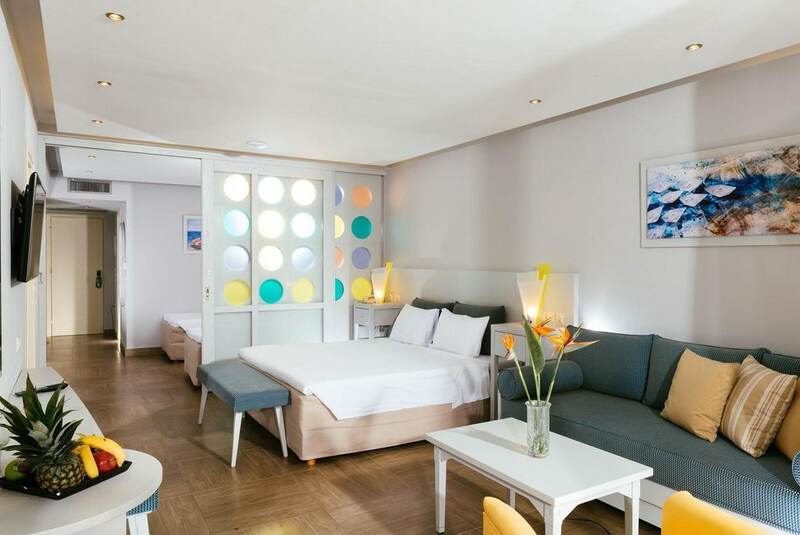 This spacious room opens to a sharing pool so close to the sea you can almost touch the waves. A room where you can spend the day in the sharing pool while enjoying the sea breeze.